I’m so excited to share these popsicles with you today. They are perfect for these hot Midwestern summers and so simple to make. Bonus points for being lower sugar, high protein, so super creamy and nutritious enough to be called a snack. Since Van’s been teething almost non-stop this summer, we share a popsicle almost every afternoon. They are perfect to soothe his sore gums and he gets so excited to strip down to his diaper and hang out on the porch licking a popsicle. 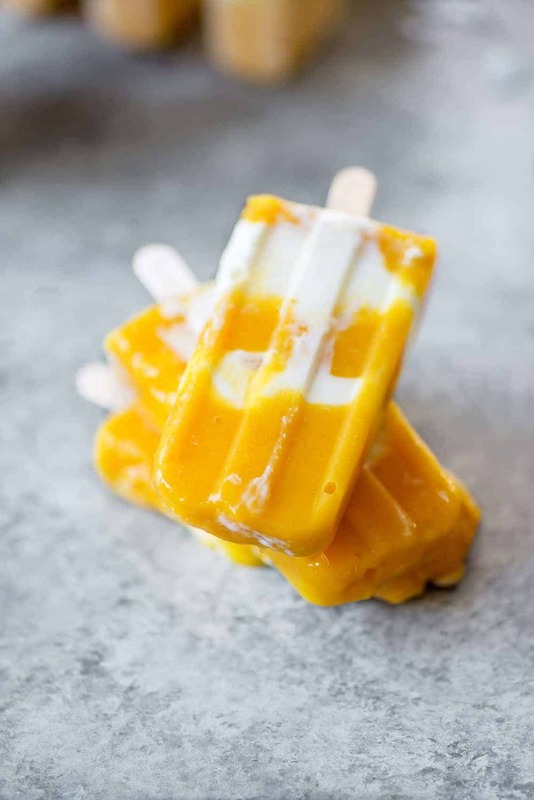 If you love creamsicle-style desserts, then you will love these mango coconut cream popsicles. Almost any fruit works in these, but I love the pairing of mango with the creamy coconut yogurt. Though strawberry, blueberry, blackberry and plum can all be swapped in. Go wild babes! Ever since giving birth, I’ve been craving yogurt almost non-stop. It’s the perfect quick snack to have on hand and fills me up for hours. That one’s been a challenge right from the get-go—having simple snacks on hand that I can eat in minutes. Since Van’s almost always in one of my arms, I like quick fuel that doesn’t take long to prepare and that we can both enjoy. Enter, siggi’s yogurt. Those of you who have tried siggis’ before know how top notch it is. I love its super creamy texture and that it’s lower in sugar than most flavored yogurts. I want my yogurt to be flavorful and healthy; I prefer to save my sugar for dessert. 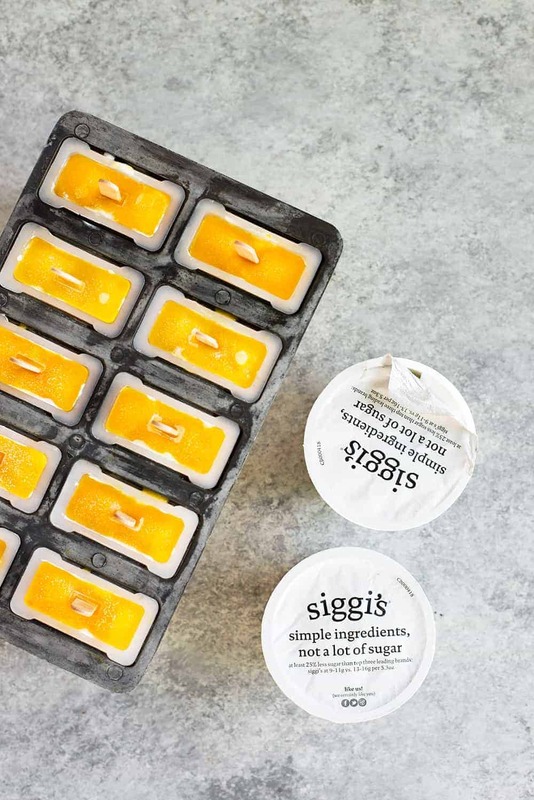 It’s just another reason I’m such a big fan of siggi’s—simple ingredients and amazing flavor options. Their coconut yogurt contains only milk, cream, coconut, sugar, pectin, lemon juice and active live cultures. LOVE that. 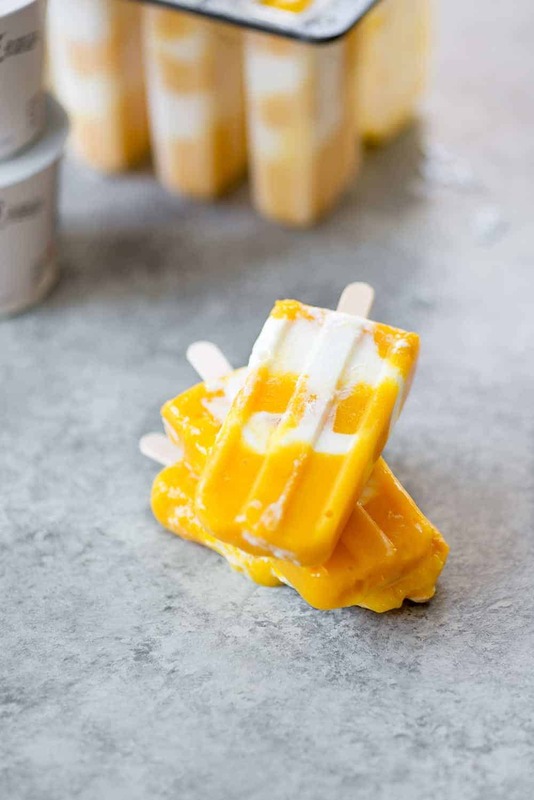 These simple mango coconut cream popsicles are perfect for summer! 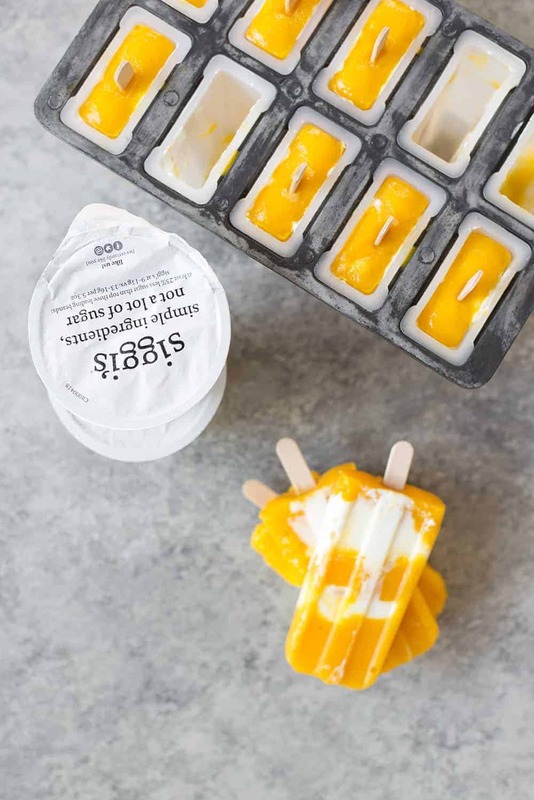 Kid-friendly and lower sugar; a healthy snack featuring mango and Siggi’s Coconut 2% milkfat yogurt. Place the mango, orange juice and sweetener, if using, into a blender and puree until creamy. 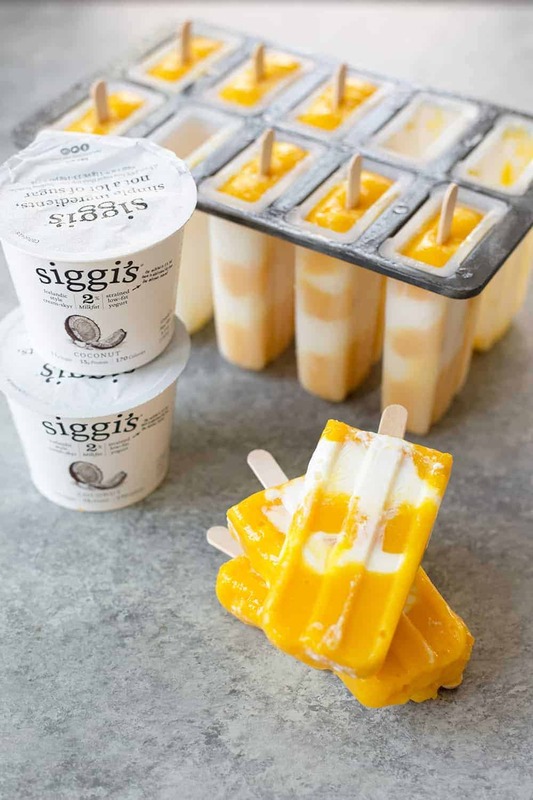 Layer the mango filling and siggi’s coconut yogurt into popsicle molds, alternating flavors as desired. Place in the freezer and freeze until hardened, about 4 hours. To thaw, remove the popsicle molds from the freezer for 5 minutes before serving or dip the popsicle mold into hot water for 10 seconds to gently loosen. This post is sponsored by siggis’ yogurt. We can’t get enough of their creamy, high protein, lower sugar yogurts. Thanks for supporting the brands that support DK.